Do you like Zelda? Did you love the Ocarina of Time? We all did and apparently Nintendo still remembers that enough to remake The Legend of Zelda Ocarina of Time on the 3DS. Despite this game being originally released in 1998 Ocarina of Time still remains one of the most popular games in the Nintendo library and they have done an amazing job bringing it to a handheld system. Zelda is still the game you loved on the Nintendo 64 complete with all of the same dungeons and secrets with some new mainstream ideas to make the game easier to play through without getting lost. Surprisingly the game transfers well over to the 3DS and manages to bring the complete Zelda experience into 3D and even make the game better than it ever was with updated graphics and more intuitive controls. The game almost feels like it was always meant to be played on a handheld. Releasing Ocarina of Time on the 3DS also seems like a great way to introduce a younger generation to one of the more great Nintendo games that they may have missed out on having never played the Nintendo 64. The third person action adventure style returns from the original game with some slight modifications. Item management is now handled with the touch screen and makes switching out and using items much easier. The button configuration feels really natural on a handheld and makes combat easy enough to pick up and play. One of the biggest additions to the game is a hint stone outside of Link’s house that will give the players hints on what to do next if they get stuck and makes the game easier for players who have never played the game before or can’t remember what to do if it’s been too long since they last played. This version of the game is not just a port of the Nintendo 64 version but is a complete remake from top to bottom. The graphics are much better as they have been up scaled and really succeed in showing off the processor power of the 3DS. The 3D function also manages to make most parts of the game look stunning even though it’s not necessary to play it in 3D. 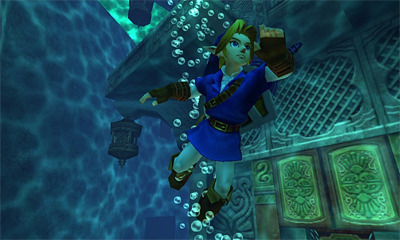 Ocarina of Time is easily the most impressive game I have seen on a handheld so far. When Ocarina of Time first came out I had never had more fun playing an adventure game and that feeling still hasn’t changed with it having been a while since I had played this game it really brought me back to my childhood when I picked it up and started playing again. This helped define my gaming experience and it still manages to deliver all these years later and is still as entertaining as any other game coming out today. Ocarina of Time on the 3DS is all of the nostalgia that older gamers want and is fresh enough to bring in a whole new younger generation into the days of classic Zelda. Even though the game is just a remake of a twelve year old title it is still the best game currently on a handheld and the only reason to own a 3DS right now. Nintendo has announced more Nintendo 64 titles coming to the 3DS and Ocarina of time is defiantly a good starting point and defiantly belongs in the library of any Nintendo or Zelda fan. No one should be disappointed with this remake of a still cherished classic. New characters, cutscenes, and sidequests may even entice veterans to journey on a second time. With all of its upgrades and additions, the 3DS port of Dragon Quest VIII is the definitive version of this classic RPG. Majora’s Mask 3D remains the creepy and weird Zelda title that everyone loves. Super Smash Bros. for 3DS is almost everything you could ask for from a portable version of Smash Brothers. It sports a huge, diverse roster of characters, a ton of new, quirky modes, and has enough collectables to keep any Nintendo fan busy for quite some time. If not for the flaws with its multiplayer, I would actually go so far as to say that it is the quintessential Smash Bros. experience on the go. I understand that people may be hesitant to buy Super Smash Bros. for 3DS with the Wii U version coming out soon, or because it's feared to be a subpar entry in the series being that it’s on a weaker handheld system, but I could not disagree more. Whether you’re a longtime fan of the series like me, or a curious newcomer, you owe it to yourself to buy this game if you have a 3DS.